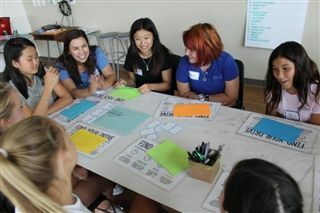 On Wednesday, September 9th, the Girls Driving for a Difference (GDD) team - a group of four, female Stanford alumni and students - came to campus for an afternoon of design thinking and leadership activities. More than 40 Pacific Ridge girls in grades 7-9 participated in a series of activities, games, and exercises designed to help them identify their strengths and discover their leadership style and abilities. Pacific Ridge was lucky to be one of the final stops in GDD's 14-week, cross-country journey of youth and women's empowerment.